A few weeks ago, I started a new habit every morning. Just after I wake, I open my gratitude journal. I got this idea from hearing of its positive impact on various blogs. Finally, I decided it was time to try adding this habit into my life. I have to say, this has made a TREMENDOUS impact on my day-to-day happiness. So, what is this “gratitude journal” and why is it so great? A gratitude journal is exactly as the name sounds — a writing outlet for what you are gracious for in life. A recent entry, right out of my gratitude journal. We have an enormous amount of things to be grateful for in life, yet we usually don’t realize this. This is often due to innocent ignorance. There are different ways to approach your gratitude list. I prefer to do a mix each day. I include the more serious, heartfelt gratitude — like appreciation of a loved one; and the more fun, laid-back appreciations — like tea and my coffee grinder! Just try to answer this question with 3-5 items each day. You will soon realize that the little things do matter, and that you need to remind yourself about those bigger things, too. 80% of us are dissatisfied with our jobs. Given that most of us wake up Monday-to-Friday because we have to get to that job at a certain time, our days don’t start well. In fact, the start may be grim. That mood is the worst way to support ourselves personally and professionally. 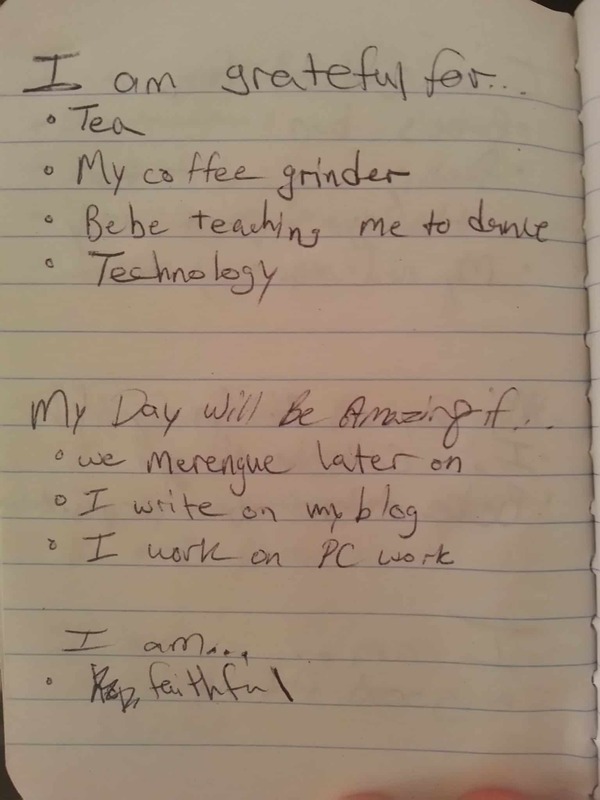 This second part of the gratitude journal should build optimism for our upcoming day. As we accomplish these items that make our day amazing, we realize that life is pretty damn good! So how do you answer this one? Think of SMART goals — specific, measurable, achievable, relevant, and time-bound. Be specific about what you want to attain. Give it a simple measurement. Achievability is important, especially if you want to appreciate each day. Relevant is specific to your wants and needs for that day. Time-bound is, obviously, irrelevant as the goals are for today! You can see I keep things light. I wanted to practice dancing — specifically merengue. I didn’t give further specifics, because I want this to be a habit, not a chore. You need to find the flexibility to keep yourself to your goals, but also keep things light. Your detailed goal-setting would take place outside of your gratitude journal. Your journal shouldn’t be a sentencing! Finally, we conclude each journal entry with an empowering statement — I AM ______. What do you need to remind yourself of to kickstart your day? You are a badass. You are uniquely talented. Remind yourself of this and get out there. My driver in this day was faith. Not religious faith, but the faith that everything will work out for the best. Faith in myself taking action and being successful. Faith was my driver. It’s your turn now. Start today, before you close this webpage. It doesn’t have to be a mini-notebook like I use. You can find a more comfortable system in the future. Sit down and focus on these. It should be one or two minutes in total, but if you want to take time for deep introspection you can. There you go. Hopefully you feel inspired instantly. You might not though. Keep this habit for the next few days and do it to start your day. If you aren’t inspired yet, you will be. What are your thoughts on gratitude journals? 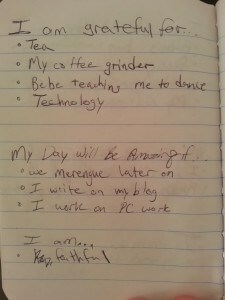 Do you keep a journal, but use different prompts? What works for you? I can’t say I’m perfect at starting new habits. There has been a day or two I missed journaling. I definitely miss it on those days! Loved it! I do similar things, but in a slightly different way. However, to get twice the effect I think I’m going to start writing it all down in my journal like you do, that’s the one thing i don’t do, although I do journal everyday.